With a new partnership between Pittsburgh schools and colleges, students can prepare for a college career as soon as they enter seventh grade. The collaboration — called the Pittsburgh Administration Collaboration — involves Pitt, the Community College of Allegheny County and the Pittsburgh Public Schools. It will provide opportunities for seventh and eighth graders to make higher education attainable and the transition between high school and college seamless through a mentorship program, starting this summer. Through offering a program to middle schoolers, PAC wants to help parents and students start thinking about college and how to financially prepare for it as soon as possible. Since the partnership was only formed recently, PAC is still in the process of identifying middle schools that will benefit from the program the most. According to Mark Harding, Pitt’s chief enrollment officer, PAC has a key component that not many other initiatives have — early engagement. In deciding how the program operates, the group will also figure out if students have to sign up for it, or if PAC will approach students who meet a predetermined criteria. In the meantime, Pitt is considering providing library, career and advising resources, while the specific programming for PAC is under development. Once the select students are in the program, Pitt Pathfinders will mentor them — allowing students to connect and invest in their education through networking, building relationships with students, faculty and staff both at CCAC and Pitt. In addition to acting as mentors, Pathfinders will conduct campus tours for PAC participants and host group activities both on campus and in middle schools. As the program expands, so will the opportunity to involve other campus groups. 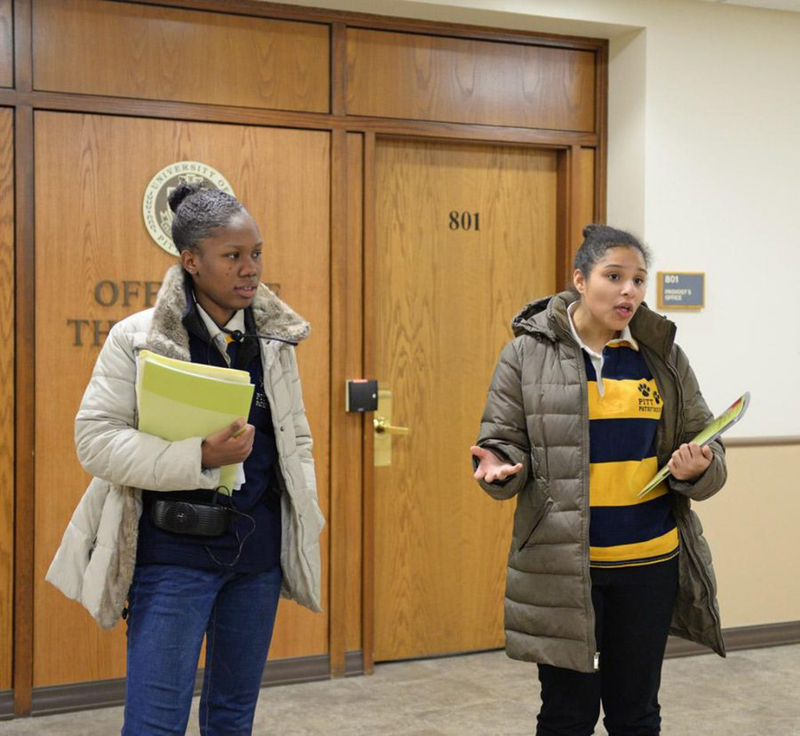 Debbie Rupert, senior director of admissions and financial aid at Pitt, also acts as an adviser to the Pathfinders and said she will assist the organization in approaching their role in the PAC program once the details are sorted through. While PAC will engage students about college at a young age, it is not the first initiative in Pittsburgh to ensure that students, specifically high schoolers, are on track to obtaining a post-secondary degree. Eligible graduates receive the full Promise scholarship — referred to as the Core Promise scholarship — as a privately funded gift of up to $30,000 over four years to attend any accredited post-secondary institution in Pennsylvania, including CCAC and Pitt, based on a minimum 2.5 GPA, 90 percent attendance rate and city residency. Students who meet the enrollment, residency and attendance requirements, but lack a 2.5 GPA, may apply for the Promise Extension Program at CCAC — a safety net that provides a option for students who complete the year-long program successfully. Branden Ballard has been with Pittsburgh Public Schools for two and a half years years, serving as a mentor and program manager of We Promise. As one of the mentors, he meets with students weekly. He said about 20 to 25 percent of participating scholars are eligible for Pittsburgh Promise, with another 40 to 50 percent eligible for the extension program. Students already participating in the extension program will have the opportunity to transfer to Pitt to complete a bachelor’s degree, provided that the students meet the transfer admission requirements and are accepted. According to the 2015 Promise Annual Report, 5,271 students received the Core Promise scholarship, with another 797 receiving the extension. Since the program’s inception, Promise scholars enrolled in over 100 institutions, with 1,478 scholars attending CCAC and 351 attending Pitt main campus. Pittsburgh Promise piloted a program called We Promise in 2012, which supports African-American male students by providing the resources they need to ensure eligibility for either the Core scholarship or the extension. The district expanded and staffed We Promise by 2013, which now helps about 500 young men in high school each year. Stuart Blacklaw, the provost and executive vice president for academic and student affairs for CCAC, wants to help transition public school graduates to CCAC, and then to prepare students to complete post-secondary education at Pitt. By providing access to student ambassadors, student success coaches, advisers, counselors, faculty and staff, Blacklaw says that this will make the process and outcome for the student more beneficial — especially in regards to the career they want to pursue. While PAC engages students to close the gap on college accessibility, it will also work with their families to jump-start the dialogue about financial planning, cost and affordability. For example, Pitt partnered with Raise.me, a social enterprise focused on expanding access to higher education for low-income and first-generation students. Raise.me enables students to earn micro-scholarships starting as early as ninth grade and throughout high school for participating in activities that best prepare them for success, such as getting good grades, volunteering or joining an extracurricular. According to Harding, with PAC, it doesn’t matter if students stay in the Pittsburgh area for college — it just matters they pursue secondary education.